There are strong indications that the Comptroller General of the Nigeria Customs Service (NCS), Dikko Abdullahi may have approved the scrapping of Direct Traders Input (DTI) cafes. 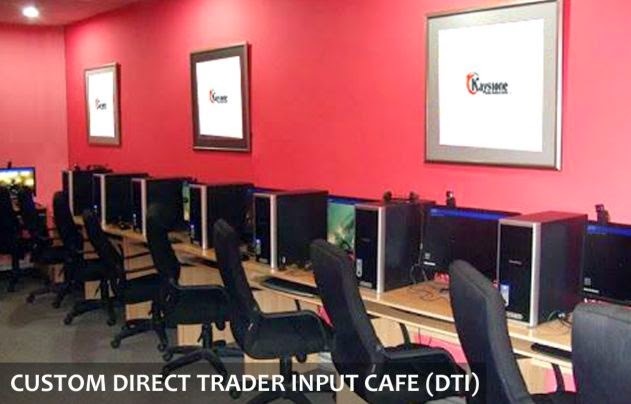 DTI cafes have come under frequent scrutiny since they were established in 2008 for allegedly being used to perpetrate economic fraud. The first set of DTI cafes were commissioned in Lagos on July 10, 2008 by then Customs Comptroller-General, Hamman Bello Ahmed. The operation of the cafes, Bello had said during the commissioning, was part of efforts to bring all stakeholders involved in cargo clearance under one community where all processes are electronically-driven. 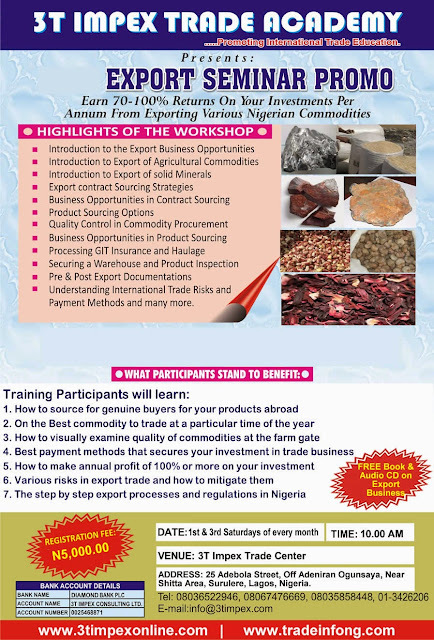 “It allows Importers or their agents to access the Customs ASYCUDA server and make their declarations directly without being physically present at any Customs port,” he had said at the time. But since they commenced operation, several of the cafes have been accused of being used for fraudulent practices. Abdullahi, had vowed in 2011 to hold accountable any DTI operator through whose cafés containers were illegally removed from the port without the payment of appropriate fees and duties. According to the Customs Comptroller General, some of the cafes had also been involved in identity theft. Usually authoritative sources said that the NCS would henceforth grant Direct Trader Input access only to licensed Customs agents. “Every licensed Customs agent will now have DTI access only on his or her computers in the office and not in a café as it used to be. The DTI access will be tied to individual licenses and anyone that allows unauthorized persons to gain access through their DTI to perpetrate fraud will be directly held liable by Customs. “What this also means is that only agents with valid licenses will have access to DTI. I think this is very good and it takes automation in the clearing process to a higher level,” a usually reliable source at the Customs Headquarters, Abuja told SHIPS & PORTS DAILY. When contacted, National President, Association of Nigerian Licensed Customs Agents (ANLCA), Prince Olayiwola Shittu said his association backs the move to scrap the DTI cafes. “We call on the Customs to scrap the cafes because they have exposed our members to unnecessary risks. “The move is welcome as it will protect our members from hackers who daily invade these cafes,” Shittu said. 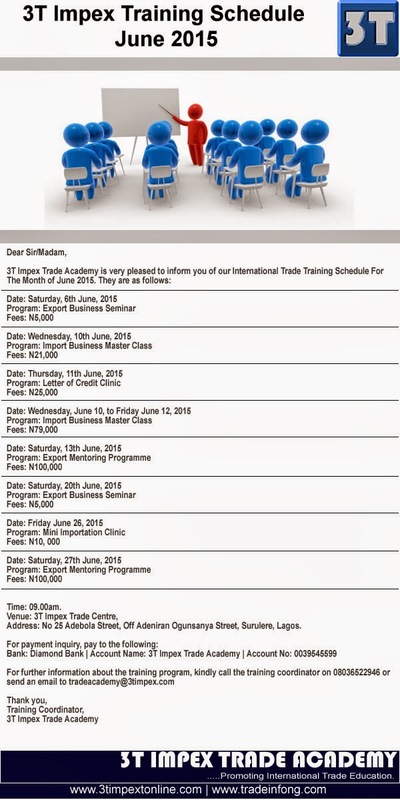 Customs spokesman, Wale Adeniyi could not be reached to comment on the development. 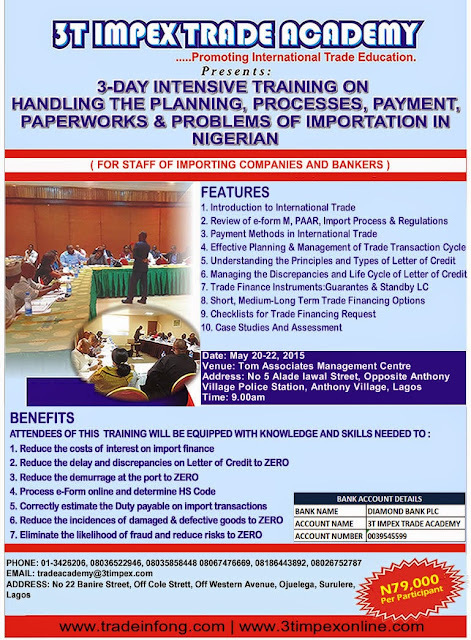 The is a short video clip on the 3T Impex Import Business Training in Nigeria.